Luiz Razia has secured the Marussia Formula 1 seat left vacant by Timo Glock’s pre-season departure from the team. Brazilian 23-year-old Razia joins fellow GP2 graduate Max Chilton in an all-rookie line-up at the squad. Razia will drive the new Marussia in Wednesday’s Jerez test session, although the team will start the day late following Chilton’s crash due to suspension failure on Tuesday. “The past two seasons in GP2 have been all about proving that I have what it takes and that I’m ready,” said Razia. “This coming season will be all about rewarding the faith the team have shown in me. Razia became a GP2 title contender last year in his fourth season in the series, eventually finishing runner-up to Davide Valsecchi. Team boss John Booth said he had always expected Razia to blossom after initially hiring him as reserve driver for the then Virgin branded F1 team in 2010. “We had every expectation that he would progress to the extent that he has,” said Booth. ”’He is a very quick and tenacious driver who battled hard to the runner-up spot last year. Marussia’s announcement means that the only vacancy remaining on the 2013 F1 grid is the second Force India seat. In addition to his 2010 run with Virgin/Marussia (pictured), Razia has also tested F1 cars with Toro Rosso, Force India and Caterham. Giedo Van der Garde has won the battle for the second race seat at Caterham for 2013, the team confirmed on Friday. Following months of discussions, the Dutchman has got the nod over Heikki Kovalainen, Vitaly Petrov, Bruno Senna and Luiz Razia to become Charles Pic’s team-mate this season. Van der Garde, who was Caterham’s reserve driver last year and won races for its GP2 team, already has F1 mileage under his belt after driving in several Friday Practice sessions as well as at the young driver test. The Dutchman had also been part of the Spyker team’s line-up in 2007, carrying out testing duties for the squad. Speaking about his move in to a race seat, van der Garde said: “I know I am ready to take the step up to F1 and all the work I have done throughout my career, and particularly in the last year with this team, has brought me to my ultimate goal. “Throughout 2012 I was able to fully integrate myself into the team, both through the FP1 sessions I ran at a number of tracks that were then new to me, and as reserve driver, fully embedded with the team throughout the season. Caterham’s decision to sign van der Garde and Pic is a departure from its previous mantra of securing experienced talent to help it in F1, and will have been motivated in part by financial considerations. Team principal Cyril Abiteboul said last year that he was keen to bring on younger men now – which has been proven with his choice for 2013. “We continue to grow as a team and we are committed to giving young talent across the motorsport industry the chance to grow with us and this is Giedo’s opportunity to show he deserves his place at the very highest level of global motorsport,” he said. GP2: 2009-12 with iSport (’09), Addax (’10-11), Caterham (’12). Five wins, best championship result of fifth in 2011. Formula Renault 3.5: 2007-08 with Victory (’07) and P1 (’08). Champion in 2008, five wins. Formula 3 Euro Series: 2004-’06 with Signature (’04), Rosberg (’05), ASM (’06). One win, best championship result of sixth in 2006. Williams will not be debuing their 2013 challenger, the FW35, until the second pre-season test, the team confirmed on Friday. The team will be present at the first test which kicks off at Jerez on February 5th, but they will run their 2012 car with 2013 livery’s testing parts. The launch of the FW35 will take place at the Circuit de Catalunya in Barcelona on February 19th, the first day of the second test. Valtteri Bottas and Pastor Maldonado will be their driver lineup for the Williams team this year. Grosjean scored three podiums and 96 points in 2012, although he was banned from the Italian Grand Prix after causing a start-line accident at Spa-Francorchamps. He said he was looking forward to repaying his team’s faith in him in 2013. 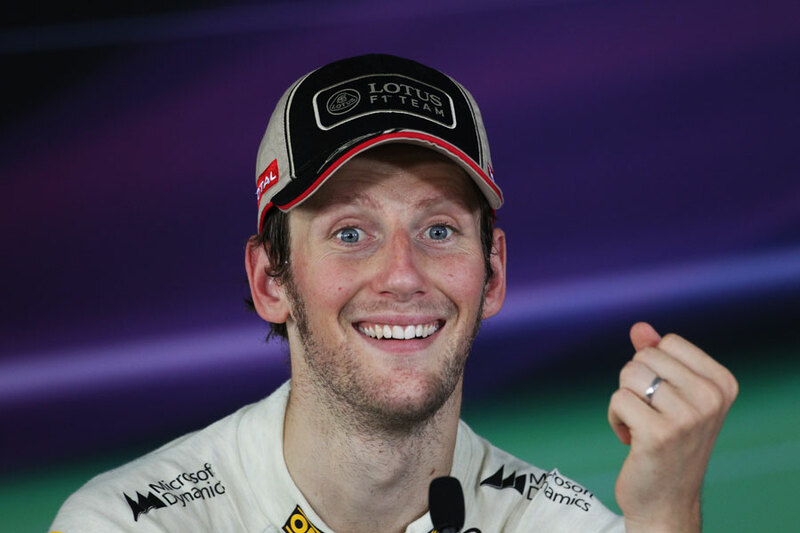 “It’s fantastic for me to be continuing with Lotus F1 Team for 2013. It’s superb to have the support of everyone at Enstone. I’m really looking forward to rewarding their faith when we take to the track in Australia. I learnt a lot in my first full season in Formula One and my aim is to put these lessons into practice with stronger and more consistent performance on track next year. Caterham have confirmed that they have signed Charles Pic on a multi year contract for the 2013 season onwards. “It is clear that he is a special talent,” said Caterham’s new team boss Cyril Abiteboul. At present, it is unclear as to who will be partnering Charles Pic at Caterham next season. Heikki Kovalainen and Vitaly Petrov currently drive for the team however it is rumoured that Dutchman Giedo van der Garde will be given the drive. Charles Pic’s replacement at Marussia has yet to be confirmed however it is more likely to be British driver Max Chilton.